"Does My Office Really Need a Facebook Page?" appeared in a 2010 issue of Dentaltown, most offices have included a page as part of their marketing arsenals. In the same time period, the number of active business pages on Facebook has skyrocketed from about 3 million to more than 50 million, so the new question is how dental offices can use those pages to get the best return on the time and money invested. In the electronic age, budgets for print directories have been eliminated—or should be—but many practices haven't reallocated marketing dollars into electronic advertising such as Google AdWords, Facebook targeted ads and post boosting, SEO and email marketing. Many offices actually budget less now for marketing, wrongly thinking that social media marketing is free or doesn't require significant capital outlay. Dentists do pour lots of marketing dollars into—and get very limited returns from—their websites. Potential new patients usually frequent dental websites only when they're choosing a dentist, so while websites are important for external marketing, they hold little value for internal marketing. Once patients have made their selection and joined a practice, they'll rarely go back and visit its website. The typical budget for a dental office on Facebook varies by the type of practice (and number of offices, if a group practice is involved). For a single office with one to three practitioners, Facebook-approved recommendations include allocating dollars for two types of marketing on the site. This places your ads in the column next to the News Feed of potential new customers. One targeting possibility includes marketing to friends of the page's existing followers. When new viewers see which of their friends already like your practice, it lends immediate credibility to it. Voilà! Word-of-mouth marketing, Facebook-style. Other targeting opportunities include: geographic (selecting ZIP codes near your office); financial; gender (women make most family dental appointments); age (unless the office is pediatric or orthodontic, marketing to 13- to 21-year-olds will reach a segment who can't afford services unless they've already founded their first start-up); education level; relationship status (engaged people are likely to want tooth bleaching before their wedding! ); and interests. I've found that a page-boosting budget of $5–$10 per day ($1,800–$3,600 a year) gives ideal return on investment. Gone are the days when if a page had 300 fans, a typical status update would be organically viewed by 200 or more of them. The average Facebook user has hundreds of friends and likes more than 50 businesses. With savvy businesses posting every day (sometimes multiple times daily) and friends and family posting a plethora of baby pictures, political rants, newsworthy stories and updates, earning organic viewership is very difficult unless you have incredibly engaging content. Boosting individual posts helps to increase viewership in the News Feed. A budget of $5–$10 per update boost will cost about $2,500 a year, because an office won't post on some days, and some posts won't need to be boosted. Facebook sends page administrators notifications when a particular post performs better than others, and recommends that admins track engagement numbers for all posts by either viewing the Timeline or using the Page Analytics tool, which provides detailed stats about posts in a concise, easy-to-read table that also provides quick links to view individual ads. Studying this information will give great feedback on which types of posts the practice should concentrate on, based on engagement. Boosting any post will increase its viewership, but boosting posts that've already shown to have better engagement than others will provide better ROI; those posts stand a better chance of "going viral" and having the message shared beyond simply the audience of the page's current followers. When it comes to getting more engagement on posts, video is king. I've tested a variety of videos on my page, including one in April of a hippo getting his teeth brushed and a series last year about the crazy ways that parents have extracted their kids' baby teeth. People love fun videos, and these created high engagement levels—including sharing, which led to more engagement and traffic on my page. Facebook recently rolled out Facebook Live, which gives anyone with a cellphone camera the ability to create a live broadcast. Live streams from a dental office might include a demonstration of a new piece of equipment, or a testimonial from a satisfied patient who just completed a veneer procedure and shows off her new smile. Imagine viewers being able to ask real-time questions and get answers while they watch the broadcast! This is a powerful new medium that's limited only by your creativity. A Facebook tool that allows businesses to create more engaging posts is called Carousel Ads. Businesses can use multiple images or videos to accompany a particular message or ad, and then track the performance of the campaign, broken down by image or video. The admin can even refine the ad, eliminating lower-performing images or videos and allowing infusion of marketing dollars into ads that have proven to provide superior engagement. Boosting posts isn't just for internal marketing. In fact, many offices find better conversions via boosting because the message appears inside the News Feed along with all the other updates, so it fits in as a seamless experience for viewers who often don't even realize they're being marketed to. Only the appearance of the words "sponsored" and "suggested post" in the upper left corner distinguish these from other News Feed posts—and because someone's footing the bill, these posts are often more interesting and somehow customized for the user, either via attempted word-of-mouth marketing or retargeting from a website the user had previously visited. Retargeting is an interesting technique that's underused by dental practices. You've likely have had an experience where you browsed to buy merchandise, such as a suitcase, and subsequently found on Facebook and other sites ads for that suitcase, from the same merchant you first looked at. A prospective implant customer might visit a page on your website devoted to implants, so it makes sense to target that individual with implant-related content on Facebook—especially because the target audience of a campaign directed only at those who've visited a website's specific page or subpage will be small. Another tool that most practices don't utilize is the ability to create custom audiences. The most readily available method for dentists to create one is by utilizing the database of patient email addresses in their practice management software. 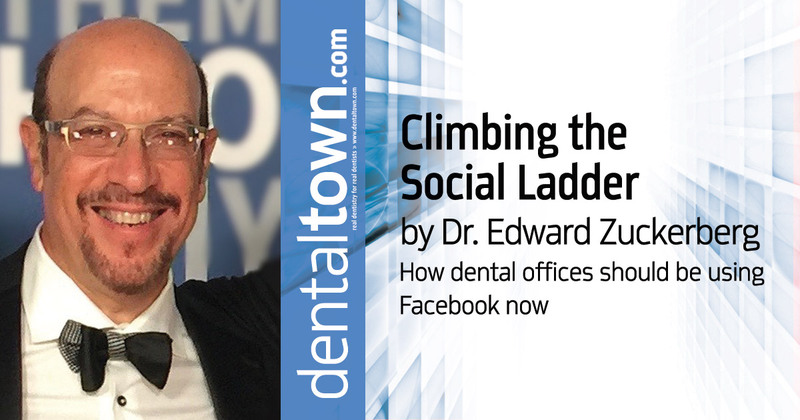 Every dental office would love to get as many patients as possible to "like" its Facebook page, but at best, most get only 10–20 percent to do so. Facebook lets you upload a list of e-mail addresses, and matches them to the database of Facebook users, creating a file for the exclusive use of the page. I've found that the size of the custom audience will be about one-third of the list submitted. Some patients aren't on Facebook at all. Some on the list already are fans of the page, while others use one email account for logging in to Facebook and a different one for communicating with your office. One note: The custom list is anonymous to the office, but can be used to market to patients of the practice who aren't yet fans of the page—quite a desirable audience for a campaign designed to get a page more fans! A couple of years ago, Facebook separated its Messenger product from the Facebook app. (Fans of a page can still message the business directly from the Facebook site, but the user experience is enhanced with the Messenger app.) The urgency of a telephone ringing at the reception area can be an unwelcome interruption to an office when all team members are occupied. Many reasons for such calls could be handled through less-urgent electronic messages, but while email has been available for years, patients who are uncertain of how long a response time will be will pick up the phone instead. 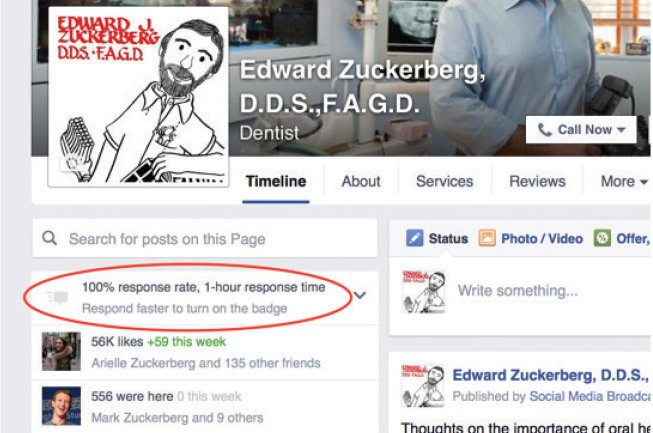 Facebook has created a badge system earned by pages that respond to 90 percent of messages in 15 minutes or less. Having the badge directly below your profile picture will encourage patients to use this form of contact, because they're more confident they'll get a rapid response to their inquiries. Admins can see the performance of the page as far as responding to messages. As you'll see in Fig. 1, the average response time for my practice is within one hour—not fast enough to earn the badge, which appears in gray only when an admin views the page. When outside visitors view the page, they don't see any message at all about our message response time (Fig. 2). I don't practice actively much these days, and am the only one responding to messages, so it's understandable that I haven't earned the badge. But with the ability to have multiple admins for a page and to get notifications on personal devices when someone sends a message, obtaining a badge should be doable for a business that's looking to promote messaging. Even without the badge, notice that Facebook provides a call-to-action on the lower-right corner of the cover photo (Fig. 2)—in this case, a "Call Now" button, which hopefully will lead to more business. 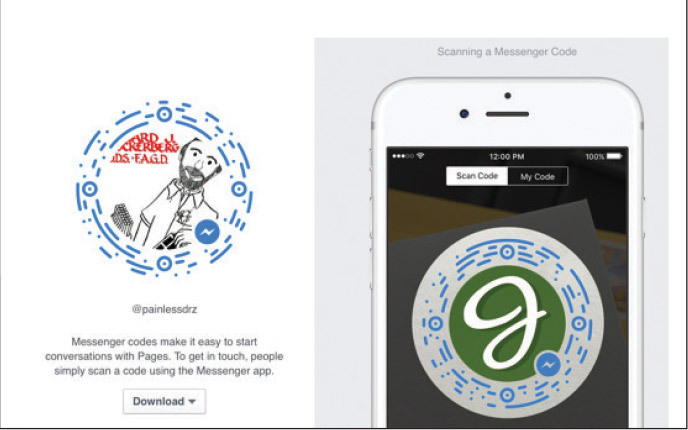 To encourage your customers to use the Messenger platform, Facebook provides Messenger codes, located at the top of your Message response page, which can be scanned by a smartphone to establish a link between the patient and the office's Facebook Messenger account (Fig. 3). And at Facebook's recent F8 Developer Conference, Messenger "chat bots" were unveiled. In the not-too-distant future, many routine requests—making appointments, accessing account information such as statements, X-rays or records, and tasks such as paying accounts online—will be possible through the Messenger app without direct employee interaction. Maybe the appropriate title for this article should be, "Does My Office Really Need to Be on Facebook Messenger?" The answer is a resounding "Yes!" 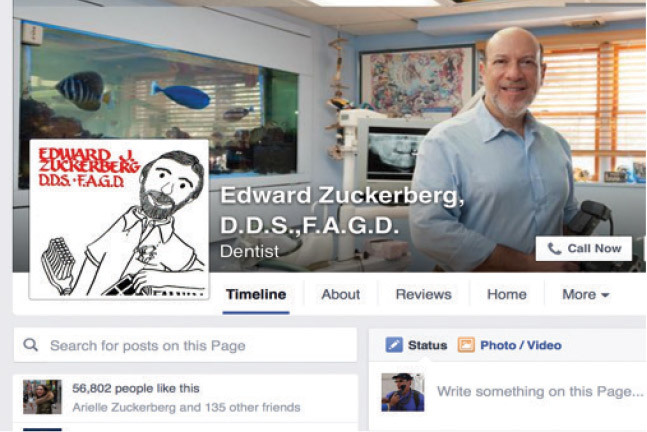 Zuckerberg lectures internationally on technology integration, social media marketing and online reputation management for dentists, and consults privately with dental practices in addition to treating patients part time in Palo Alto, California. He wrote the chapter on social media on the ADA's recently released Practical Guide to Internet Marketing. 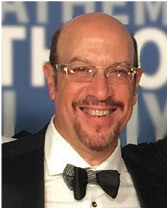 His Facebook page (facebook.com/painlesssocialmedia) contains tips for colleagues on how to use social media to promote their practices, attract new patients and maintain and improve relationships with existing ones.